Anyone integrated Smartthings into Hassio yet? Has anyone been successful with any of the guides that walk you through the integration in Hassio? I’m not sure yet how to get started as it’s command line based and I’m not very familiar with linux… but I’m hoping to attempt this. Jer and St. John describe how they connected SmartThings with Home Assistant. 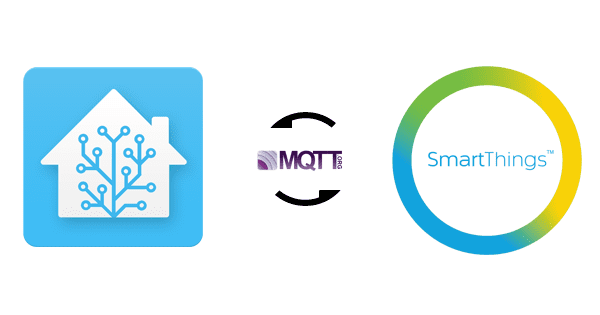 There is an add-on for the SmartThings MQTT Bridge at Repository: Few addons. I’m writing a long tutorial on how to do this specifically a Raspberry Pi w/ Hassio installed, and the Hass.io plugins MQTT Broker and Vkorn’s SmartThings Bridge. Stay tuned! This tutorial is for those using a Raspberry Pi with Hass.io, and the Hass.io add-ons: Mosquitto broker (included in default repository), and SmartThingsBridge (from vkorn’s repository). There are other tutorials out there, but not specifically using the items listed above. I’ll continue editing this post for corrections/cleanup. For a basic understanding of how the communications works from Smartthings to Home Assistant and vice versa, check out this image posted on the HA blog. It won’t make sense now, but should later on. We are creating the Bridge SmartApp (in SmartThings), Device Type (in SmartThings), Rest Bridge (in HA), and Broker (in HA) in this tutorial. The default port of Mosquitto Broker is 1883–the SmartThingsBridge add-on will need to connect to this port. Check that this port is listed correctly in the SmartThings Bridge add-on options. Make sure the add-on is installed correctly by checking the state and logs for any errors. You can see the state and logs when you view the add-on’s info from the Hass.io section of the Sidebar. A new section called ‘Vlad’s repository’ should appear and you should see his SmartThingsBridge hass.io add-on. Click on it, open, and install. Make sure the bridge’s default port is 2080–the SmartThings device will need to connect to this port. You will need to make sure this port is listed correctly in the SmartThings device. Note: I am not sure what the “broker_host: 172.17.0.1” in the Options means. I left it as-is because I was able to connect the broker and bridge using these default settings. Double-check the preferences of your newly created Smartthings Device. You can edit the IP address and port, which should be the local IP address of the RPi hosting HA, and the port 2080, if you’ve been following my instructions. I had issues creating a SmartThings device because I could not fill out the device sections ‘Location’ and ‘Hub’. You should have registered your Smartthings hub by now and it should show up under the ‘My Locations’ tab. My hub was registered, but it wasn’t showing up properly in the ‘My Hubs’ section. To fix this, I clicked on ‘My Locations’, my hub, then on ‘List Devices’. Once I navigated here, I clicked on ‘My Devices’ at the top section and was able to see my hub and devices. I was able to add a new device with the location and hub drop-down menu properly showing my Smartthings hub. It will just magically work one of these days. Follow the steps in this tutorial (BUT ALSO SEE MY NOTES BELOW), starting at the section ‘SMARTTHINGS APP’. Stop after you’ve completed that section and return to this tutorial. One difference in the tutorial you will need to change is that the MQTT bridge port you use is 1883, not 8080. We are using a different MQTT broker than what is used in the linked tutorial. In the Inputs section when adding the SmartApp, select the inputs and the supported devices that you want to communicate to Home Assistant. I did not select any Philips Hue light bulbs since HA does a great job connecting to the Philips Hue bridge. I’ve read forum comments saying that using ‘localhost’ should be fine. The tutorial says replace it with the location of the broker. You may need to experiment with this if things aren’t working for you. In the SmartThingsBridge logs, do you see entries like “Saving current state”, “Subscribing to…” or “Incoming message from SmartThings…”? If so, then SmartThings is communicated to the SmartThingsBridge. In my example, I am adding a Z-Wave door/window sensor that reports open/closed. We will use a MQTT binary sensor to represent this in HA. Other sensors can report more than on/off and you will need to use the correct MQTT sensor in your configuration.yaml. Look at the related components on this page to see the different MQTT sensors. NOTE: this is case-sensitive! Open != open. Use the exact case listed in the logs when you create your sensors in configuration.yaml. payload_on: "open"     #This is case sensitive! payload_off: "closed"    #This is case sensitive! Super helpful! Thanks so much for a clear and concise walk through. Where were you when I tried setting this up a week ago?! Setting the port number in the device in SmartThings to match the bridge_port in the Bridge configuration was the piece I was missing and didn’t find that anywhere else. OP here. I was able to resolve my issue a few days after creating this post. The problem was my MAC address. I tried getting it from running ifconfig on the Pi and the MAC address it was returning was for Docker and not the actual Pi. It’s been so long now that I can’t remember the way of getting the real MAC from the Pi but I’m sure someone can chime in with that answer. I didn’t read the tutorial that was posted above but it sounds like its already helping people so I’m super happy abut that! Good luck to everyone and just know that it IS possible to get working! I also read somewhere and learned why the Hassio MQTT broker plugin options lists ports 1883 and 8883. Port 8883 is used if SSL is enabled, 1883 if SSL is disabled. I would love to know if anyone was able to turn on SSL with the broker! 1513692029: Config loaded from /etc/mosquitto.conf. 1513692029: Opening ipv4 listen socket on port 1883. 1513692029: Opening ipv6 listen socket on port 1883. 1513692029: Warning: Mosquitto should not be run as root/administrator. 1513692029: New connection from 172.30.32.1 on port 1883. 1513692029: New client connected from 172.30.32.1 as 41d3ef5e-de10-4b4f-8a80-1f89349e6bf3 (c1, k60). 1513692919: New connection from 10.0.10.11 on port 1883. 1513692919: Socket error on client , disconnecting. info: Connecting to MQTT at mqtt://172.17.0.1:8888. Does it seem right? I did add the switches in the Configuration.yaml file and after restart the I see switches on the homescreen but doesn’t work. Could you please help me on this issue? Double check the ports you defined. I never used port 8888 in my tutorial, but your logs show that the Smartthings Bridge is trying to connect to the broker at port 8888. Might I ask if you have a few examples of a light and a switch perhaps? I finally bought some Sengled Zigbee light bulbs on sale from Amazon and added them to SmartThings and HA. If your bulb supports RGB, then you need to add more parameters than what is listed here. I don’t fully understand the ‘optimistic’ variable, but it was used in an example. Here is what you should write in your configuration.yaml file. that turning on/off and changing brightness doesn’t work from HA, but on/off states are reported correctly. Anyone else have this problem or a solution? Great guide!! It was pretty easy to follow and seems that everything is working. I do have a little issue in that when I look at my logs for the plugins I see messages that look like things are working but I do not see anything about the actual devices or device names so I don’t know how to create them in HASSIO so I can see them and use them. New Connection from 172.x.x.x on port 1883. New Client connected from 172.x.x.x as 89xxxxxx-xxxx-xxxx-xxxx-xxxxxxxxxxxxx (c1, k60). Saving in-memory database to /data/mosquitto.db. This tutorial is EXACTLY what I needed. I am a newbie to all of this and currently use SmartThings, Webcore, and ActionTiles for home automation, but have an extra RPi and decided to try out HA. Are there any good examples out there of configuration.yaml entries for different devices? I wonder if you didn’t configure the Smartthings MQTT bridge app correctly. You have to open the Smartthings app on your phone/tablet, navigate to the MQTT smartapp you created, then make sure you added all your sensors and switches in every setting (battery, contact sensor, switch level, etc). Then generate some activity on your sensor by opening/closing a door, and check your logs for the SmartBridge add-on. I deleted all the smartthings pieces and recreated them and now it’s working. Thanks!